This was SOOOOOOO GOOOOOOD and it made a lot and I'm don't think I could be more excited about leftovers. HA. You can really use any veggies or any garnish. Preheat the oven to 350 degrees. Place butter or oil in large dutch oven and heat on the stove. Salt and Pepper all side of pork and place in dutch oven, brown on all sides. Add chicken broth, soy sauce, rice wine vinegar, ginger, chili paste, lime juice and brown sugar and bring to a boil. Cover and place in the oven for 1 hour to 1 hour and 30 minutes for boneless and 1 hour 30 minutes to 2 hours bone in. Let cool for one hour (cool enough to handle pork). Shred place pork back in crock pot and add mushrooms and broccoli. Cover and cook and additional 10 to 15 minutes. Add noodles to the pot and cook for about 5 minutes or until they are cooked completely. Adding water if necessary. You can also put the beginning ingredients in a crock pot on low for about 7 to 8 hours and add the rest and switch your crock pot to high until everything is cooked. 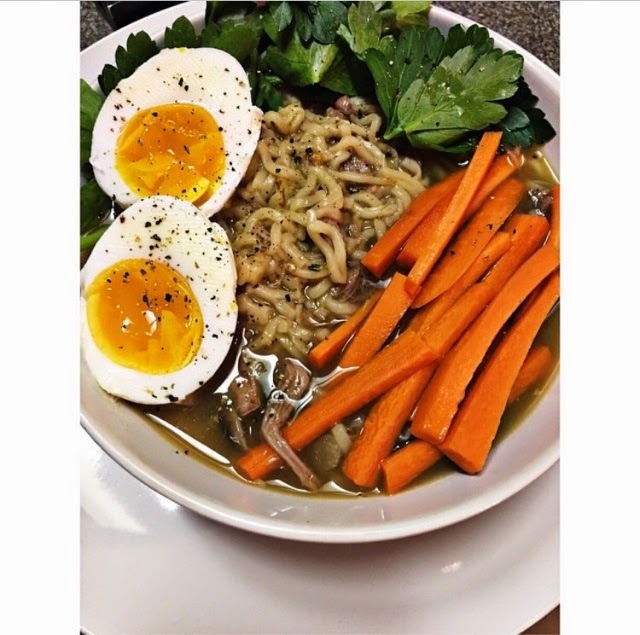 Top your bowl with your soft boil eggs and garnishes and spoon that goodness right into your face hole. We also paired this dish with a Pinot Nior at dinner.